One of the great things about using shipping containers as building blocks for a home is that they can be built in any direction – horizontally or vertically. The outcome in recent years has been a huge variety of apartment complexes being constructed out of shipping containers, and really they are only limited by an architect’s imagination. They can be constructed very quickly. Cost to build is very low relative to their brick built equivalents, with much of the fixtures and fittings installed offsite in a factory before being taken to the site. They have a relatively small footprint. As with any apartment, the idea is that more people can live in the same area of the ground than a one storey building. This means that rents per square foot on the ground can be higher, generating greater revenues. Because they are different they are often popular among potential tenants and buyers simply because they stand out from the crowd. We take a look at a number of apartment complexes for a range of uses, from luxury blocks built for professionals in Detroit, USA, to student accommodation and art space, and social housing designed for people who have had tenancy problems in the past. 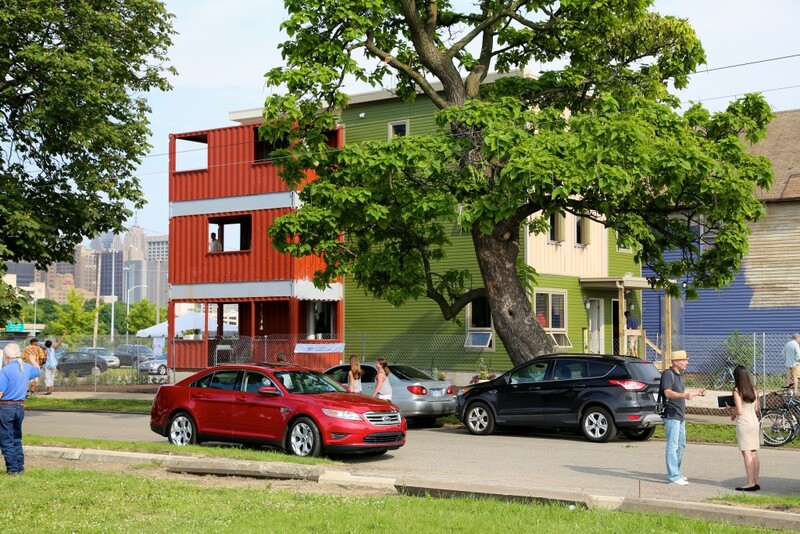 Let’s start with the luxury end – shipping container apartment complexes in Detroit. A new building program is underway in Detroit in the US midwest to construct luxury apartment complexes across the city. Detroit is recovering from the closure of its famous car factories and, as part of its new look, the city is being reborn with innovative building projects. This includes the container focused apartment building Rosa Parks by San Diego based developer Three Squared. The twenty home complex took less than six months to build from laying the foundations until the apartments were ready for their new owners. There are one, two and three bedroomed apartments that all have two bathrooms. The three bedroomed homes at Rosa Parks cost around $350,000 and are set in the leafy suburbs of the city. The complex is near Detroit’s Wayne State University which is encouraging young professionals and their families to settle and work in a city that, let’s face it, has a bad reputation for crime and social problems. Closer to downtown Detroit in North Corktown, the architects of Three Squared Inc have also built a show complex consisting of a three bedroomed, three story family home and a one bedroomed unit. Both have balconies to enjoy the summer sun, and the smaller one will cost only $150,000 – an ideal first rung on the ladder for a first time buyer. There will be a third phase to the project in another part of Detroit too. Kaline Squared is being built very close to the downtown area of the city, and will consist of mostly one room, 640 square foot apartments. It will also have two, 1320 square foot apartments that have two bedrooms and will be spread across two floors in a ‘maisonette’ format. These will go up at a blistering pace, with the schedule taking seven weeks from foundation laying to completion. The speed of construction, quick return on investment of such complexes, as well as their modern, attractive appearances tend to draw people looking for a different way of life. The container apartment complexes are clearly new shoots growing out of the ruins of a city that is being reborn. The Container City I and Container City II complexes in London, England, paved the way to architects and lovers of modern design as to the flexibility and beauty of container homes and work areas. Designed and built over 10 years ago in the fashionable Docklands area of the city, they were part proof of concept and part practical, flexible living spaces. London is one of the most expensive places to live in the world in terms of property prices. As the housing bubble grew before the Credit Crunch, in 2004 the first container apartments were sold for as little as $75,000. Today, single car garages sell for more than that in London so those who bought into the scheme made really good investments. Speaking to the UK newspaper the Telegraph, one of the first residents explained what life is like in their ultra cheap home on the River Thames. Whereas property prices have become just silly in the city, keeping its creative heart beating is a very important thing so there is a genuine mix of people. The Container City apartments are designed to be art and work spaces as well, so creatives can live and work close by likeminded people and help form a nucleus of creativity in a city increasingly dominated by the extremely well-off. The project was designed to enable artists on a low income to live and work close to the centre of London. The resident who spoke to the Telegraph above is a makeup artist and does a lot of her work in her apartment. Birds of a feather flock together and it is well known that communities of creatives help each other in their work, inspiring and driving each other into ever better projects. Speed of construction. Container apartment blocks can be built extremely rapidly – you just have to look at the apartments in Detroit above to see that from the ground being cleared to students moving in, can take only 8 weeks or less. This means that the rental revenues can start rolling in much more quickly than a longer build. The speed of construction also minimises the cost of construction. Such ease of construction minimises man hours, which form a sizeable proportion of the overall cost of the project. Size of living space is often less of an issue for students who may only live in their apartments for half the year before heading back to their parents outside of term time. They will not be bringing all their possessions and will just have what they need. Linked to size is the footprint. The reason for skyscrapers being invented was so that more floor space could be built on a smaller footprint. Essentially by building high, you can fit more accommodation than a two storey house, reducing the amount of land you need to buy to accommodate a larger number of people. Containers are designed to be stacked up to 5 high at sea and in port, so are designed with these loads in mind. Rents can be lower for the tenants too, as there is less cost in the build. This was a major factor in the construction of the Catholic University apartment buildings in Washington DC where students with a low income could still live in a central location in the city without paying exorbitant rents. Efficiency doesn’t always have to mean spartan or boring. Though from the perspective of the developers they are built efficiently, they are frequently very popular among those who live in them. The Keetwonen student accommodation in Amsterdam is the second most popular student complex in the city because all the units have their own bathrooms and kitchens, thereby allowing the residents an element of autonomy and privacy from their colleagues. Not all of these container apartment complexes have been built from recycled containers. The designers of Keetwonen chose to build using new containers specially built ordered from China. Even so, they were adapted in the Netherlands and form the same footprint as the recycled containers that are often used in building construction. The one storey, Skaeve Huse complex in the port area of Amsterdam was designed and built for people who have difficulty getting housing anywhere else in the city due to their mental health, drug problems or learning disability. The term ‘skaeve huse’ is Danish and roughly translates into ‘special housing for special people’. The residents in question have been evicted from previous accommodation due to their behavioural issues and needed secure tenancies where they can establish themselves without risk of being thrown out of anywhere else. The six homes consist of one, 40ft container per home and have a kitchen and bathroom in each. They are built to be easily cleaned, and with windows only at the front of the units, sit side-by-side so residents cannot be visually disturbed by their neighbours. The units are over a hundred metres away from the nearby community so they cannot disturb anyone with noise or antisocial behaviour. The Amsterdam complex was based on an idea developed in Denmark, but has been so successful that a number of other skaeve huse complexes have been built around The Netherlands. Thereby enabling people who would normally end up institutionalised or sleeping on the streets to have somewhere to live and a certain tolerance for their different outlook on life to the rest of society. One of the major factors leading to these homes being made of containers is their durability and toughness. Designed to be bashed about in ports and to withstand serious abuse throughout their working lives, the steel containers can handle someone who behaves differently to the norms of society. Container Apartments – the way forward? As you can see, shipping container apartment complexes can be built very quickly at a far lower overall cost than their brick built equivalents, yet still be very appealing to live in. Whether the end use will be by professionals living in the city, students in need of cheaper accommodation, or people who have to live in specialist accommodation due to their disabilities, shipping container apartment complexes can be built around these requirements due to their flexibility. Considering building an apartment complex? Give the team of experts a call at Gateway Container Sales. We have many years’ experience in helping developers select containers and modifications you might want. We’ll find out if it can be done in-house, or point you in the direction of qualified tradespeople, architects or engineers who can put you on the right track to building an amazing container apartment complex. You’ll be able to work out a realistic budget and get your container project underway in no time!